The viola part for the Overture from Rossini's La Gazza Ladra has been edited by Israeli-born Yizhak Schotten, an internationally acclaimed musician whom STRAD Magazine has called "one of America's finest viola players... a leading light of the U.S. viola establishment." Schotten's bowings, fingerings and other editorial markings have been added throughout the score. Gioachino Rossini La gazza ladra (The Thieving Magpie) is an opera in two acts first performed in 1817. The Overture, its most recognizable part, is musically notable for its use of snare drums. The unique inspiration in the melodies is extreme, famously used to bizarre and dramatic effect in Stanley Kubrick's A Clockwork Orange. This memorable section in Rossini's overture invokes the image of the opera's main subject: a clever, devilishly thieving magpie. 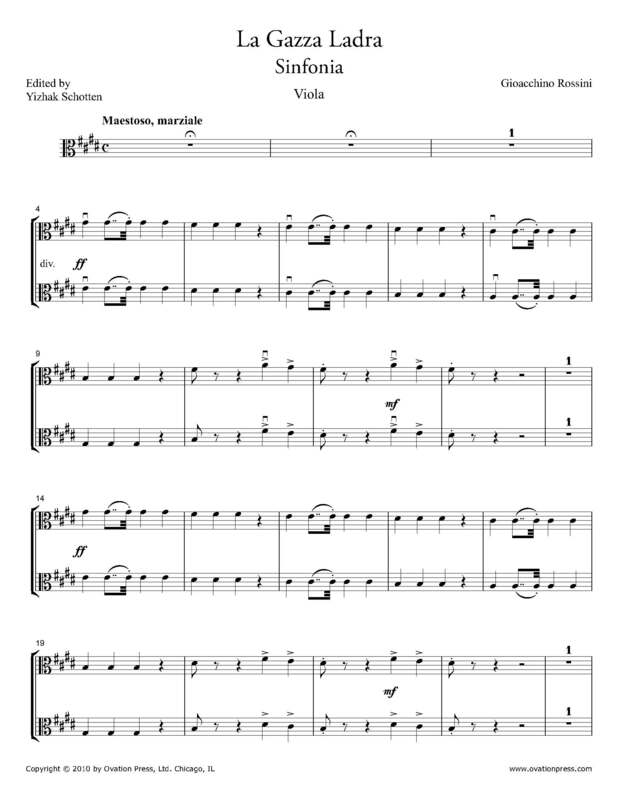 Download and print the score today to gain access to expertly edited Rossini La Gazza Ladra Overture viola fingerings and bowings from Yizhak Schotten!